Spotted this truck outside the local grocery store. Note that the feds are doing next to nothing around here because Republicans in Congress blocked the money — they demanded defunding a women’s health program (Planned Parenthood) in exchange for saving babies. Yes, this election is literally a motherhood issue. As I said, no word as to when they’ll spray again. Recall that Naled is dangerous. County Spraying Naled — At the Wrong Time of Day? Vasquez, of the county’s mosquito control unit, also said that while initial spraying had reduced mosquitoes, the number had started to rise again with recent heavy rain. The county plans to conduct eight aerial treatments altogether, four with an insecticide called Naled and four with BTI, an organic larvicide to attack eggs. The area has been divided into sectors, with nine teams doing door-to-door inspections in search of breeding mosquitoes, he said. — Zika Virus: Count rises in Miami with another case. There are two problems here. First, Naled was banned by the European Union in 2012 because the risk to humans and to the environment was deemed unacceptable. There’s also a question of timing. I assume that in general it’s better to do aerial spraying when fewer people are on the street so as not to get the spray on people. (Seems logical, but if any readers are expert in pesticides, please correct me if I’m wrong about that.) But when the Air Force sprayed, it did it in the evening when the mosquitoes are most likely to be flying: “Since it is an aerial spray, most mosquitoes have to be in the air to contact the material, that is why we do it so close to evening when mosquito populations are coming out of their hiding spaces” said Lt. Col. Karl Haagsma, entomologist for 910th Airlift Wing. On Wednesday, a low-flying plane misted the area with a nontoxic larvicide intended to kill mosquito eggs, Casey said. But a flight that was scheduled to fly at 6:30 a.m. was still flying overhead at 10 a.m., angering business owners already on edge about scaring away customers. I’m no biologist, but isn’t this the worst of both worlds: spraying when all the humans are up and about, but not the mosquitoes? 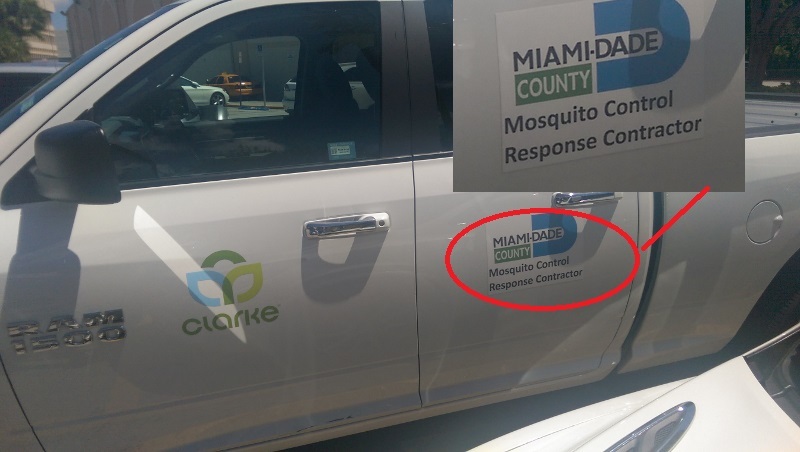 Miami-Dade County, at the request of UM, conducted a mosquito survey of the Coral Gables campus this past weekend; they found no active breeding locations and did not recommend spraying. Mosquito surveys for the medical and marine campuses were requested last week and are expected to be completed by the end of the week. The medical school campus is a mile, if that, from Wynwood, but the Coral Gables campus where I am is about 7.5 miles from the near edge of Wynwood. U.M. says we’re 10 miles away, but I think that is the driving distance; I suppose mosquitos may take the freeway when they hitch a ride. On my map, ten miles North-East from the law school puts you beyond Little Haiti. Wynwood to Coral Gables as the crow, er Aedes aegypti mosquito, flies.